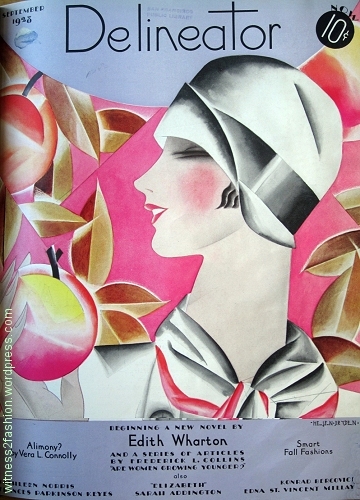 Cover of Delineator magazine, September 1928. Illustration by Helen Dryden. 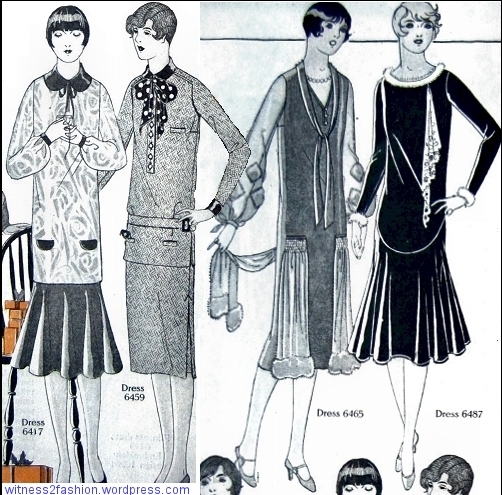 Butterick patterns for January 1928. Delineator, p. 33. Composite from original illustration. I’ll return to these patterns in a later post. Love that coat! There’s a strong Art Deco influence in the geometry of day dresses, and there’s drama, beading, and a flutter of chiffon in the evening. 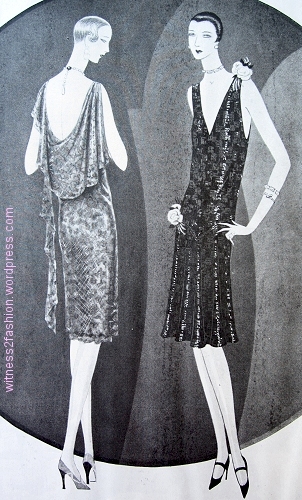 A gown from Paquin, February 1928, and a jewel-studded evening gown from Lanvin, March 1928. Delineator magazine. 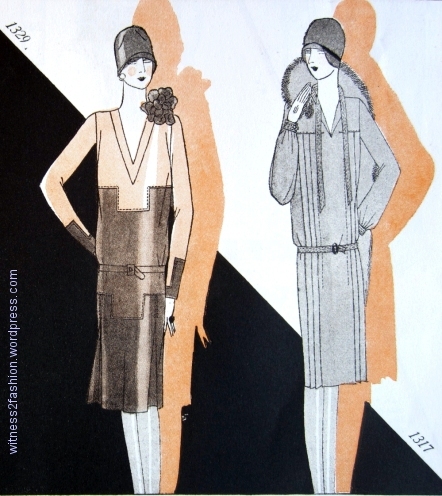 For a knock-out evening coat by Lanvin, circa 1927, click here. 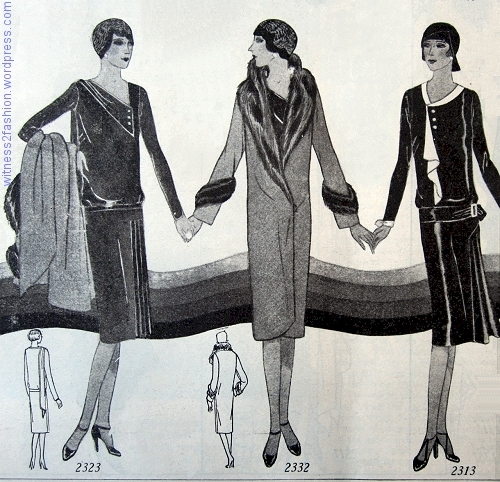 Perhaps it’s because I’m a sixties’ girl that the proportions of 1928 look “right” to me. 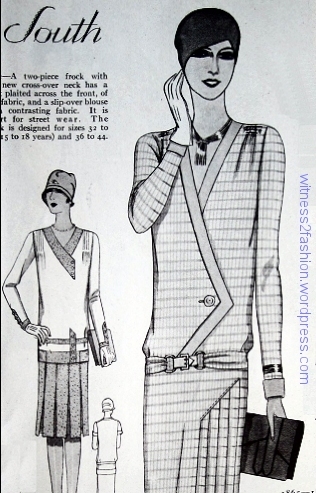 Not that I would ever want to wear a straight-torso-with-hip-belt dress, but the knee-length skirt balances them better than the skirt lengths of 1925 or 1926. 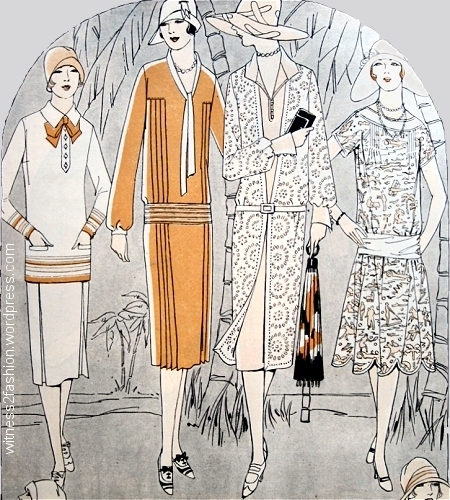 Print fabrics, Butterick patterns; Delineator, August 1928. With my library time machine, I’m currently “visiting” 1926, 1927 and 1928. I try to bounce around from decade to decade in this blog, but getting out of the late Twenties is going to be hard. 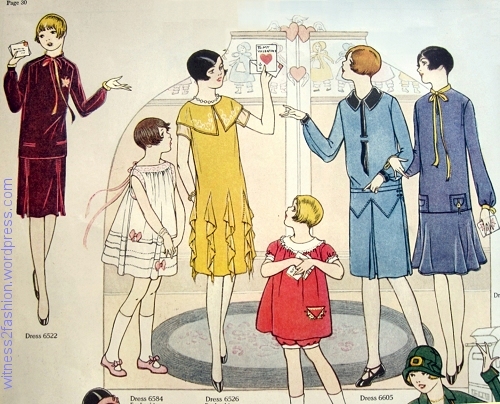 Joyful geometry: Butterick patterns in Delineator, February 1928. I love the way the angle of the trim on the bodice is echoed by the angle of the pleated skirt panel. Interesting that the button is located at the natural waist…. 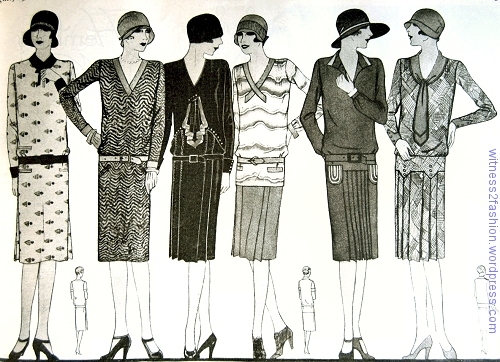 I’ve already written about the fashion shift of the mid-twenties (click here.) 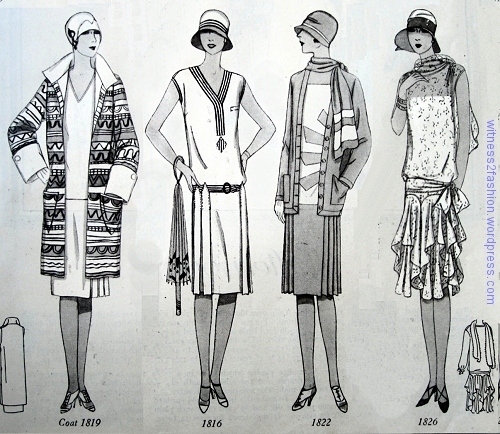 Just to review, fashions for young women (15 to 20) were slightly shorter than those for mature women in 1925 and 1926. 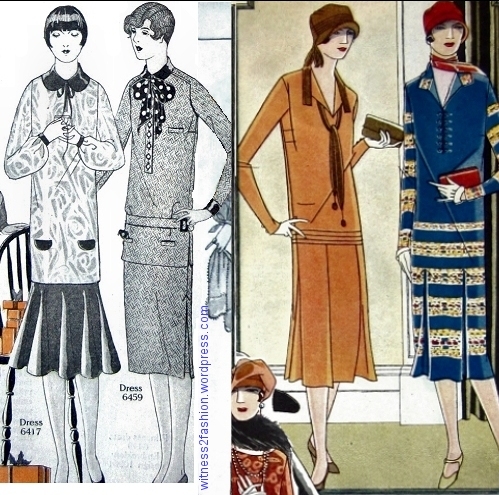 Patterns for adult women, Delineator, December 1925. Patterns for girls 15 to 20, and small women. Delineator, December 1925. Left, teens 15 to 20; right, adult women. Composite based on Delineator ilustrations, December 1925. Because teens and adults were drawn differently, it’s hard to get an exact comparison, but the hems on the adult women seem to be a couple of inches farther below the knee. When I compare the two dresses in the center, the orange one on the right looks dowdy to my modern eyes. All four figures are drawn with impossibly long torsos. Pictured are two little girls, and four girls aged “8 to 15 years.” Their dresses are quite short, but look like young adult fashions of a year later. Delineator, February 1926. The proportions on these knee length skirts look “right” to me, but they are not dresses for young women; they are for girls under 15. I especially like that plum colored outfit on the far left. Two adult women flanked by two girls aged 8 to 16 years. Delineator, February 1926. Women’s fashions with straight silhouettes. Butterick Nos. 1329 and 1317, Delineator, March 1927. 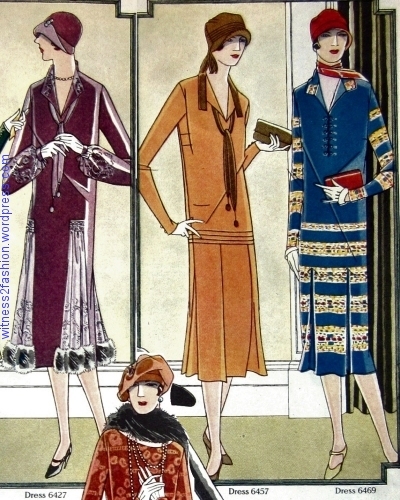 I love the use of graded values of the same color, and those repeated geometric, Art Deco jogs on the dress at left — with matching cuffs. Skirts end just below the kneecap. 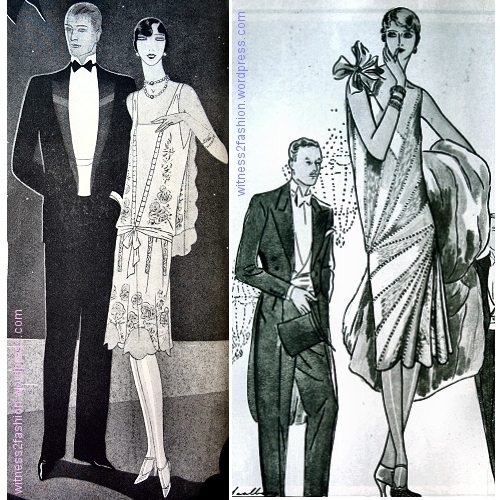 These couture designs for evening, 1927, use metallic fabrics and beading, and look quintessentially “Twenties.” It would be hard to mistake the dress on the left for any other era. 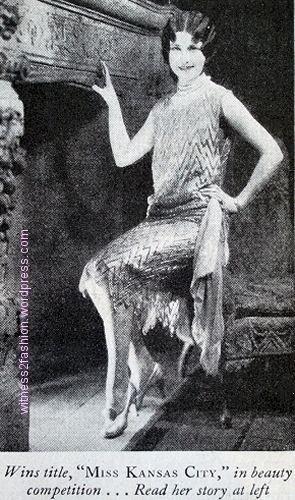 Left, a salmon pink-and-silver fringed and beaded evening gown by Paquin; right, a straight gold metallic cloth dress with finely pleated ruffles, by Yvonne Carette. Delineator, January 1927, p. 16. Two evening dresses by Chanel. Left, “deep orange” lace; right, a dress completely covered with black beads. Delineator, January 1927. 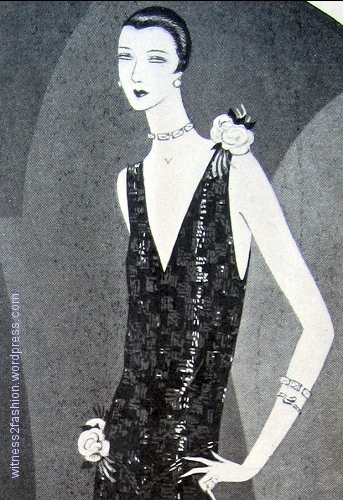 Detail of paillette beading on black Chanel dress; Delineator, January 1927. Apparently the beads change direction, giving a checkerboard effect. The Metropolitan Museum has a beaded dress from 1926 attributed to Chanel; click here — and don’t forget to click on “Additional Images” for a a close-up of the beading and spangles. 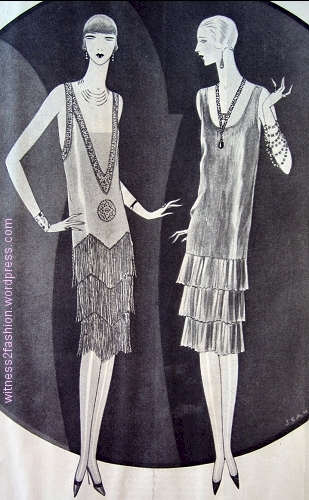 Two women’s dresses from October 1928. Butterick patterns 2243 and 2267. Note the zigzag formed by the skirt panels at right. It’s hard to see, but the band on the left dress is two colors, or two shades of the same color. Fleischmann’s Yeast ad, Delineator, May 1928. Butterick patterns for misses and women (from teens to bust 44″.) The coat came in sizes 46 and 48, too. 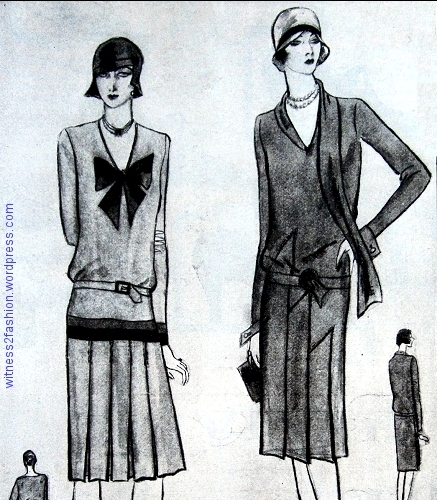 Delineator, November 1928. Hems are already on their way down. For more about 1928 “Hems Going Down,” click here. This cartoon dates from 1929.